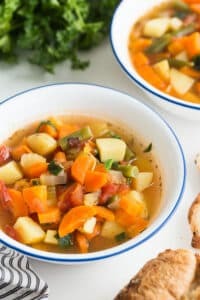 This Instant Pot Vegetable Soup is quick, easy, healthy and comforting! The perfect pressure cooker soup recipe to see you through the winter! 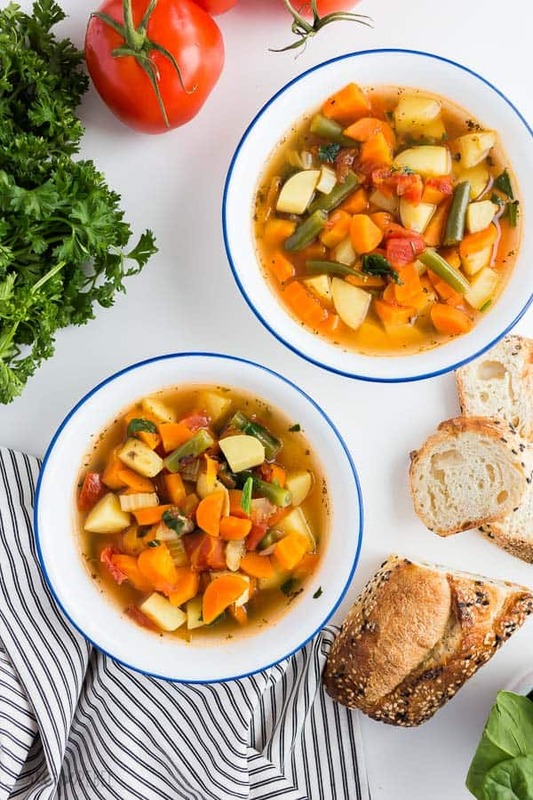 Here I am — the girl who doesn’t eat vegetables — with an Instant Pot vegetable soup recipe?! First of all, I do eat vegetables, I’m just a little picky about the way they’re served (I prefer them cooked, and am definitely not a fan of salads). Second, I love soup Big Time, and will eat just about anything you throw in it. 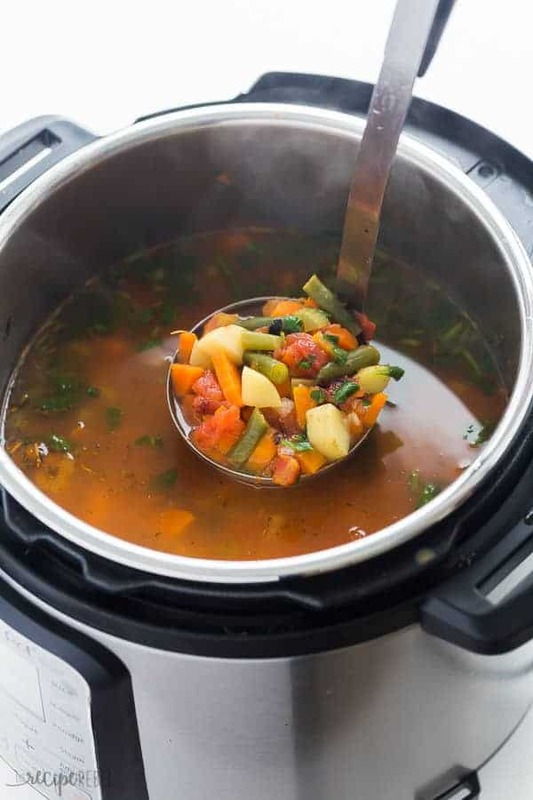 As a fully grown adult who understands the value in getting a wide range of foods across all food groups, I also love fuelling my body with things that are packed in nutrients, like this pressure cooker vegetable soup. How long do you cook vegetable soup in the Instant Pot pressure cooker? The tricky part about cooking vegetables in the Instant Pot is that they cook so incredibly quickly. Broccoli and cauliflower are the veggies I just won’t touch (go ahead and judge), so I’ve left them out of this soup. They also tend to become overcooked and mushy relatively quickly. If you like some of your vegetables to have more bite to them, you may want to toss them in at the end, right after opening the pot so they steam and soften somewhat but don’t become overcooked. I opt to chop the firmer vegetables into smaller pieces, and go for a very quick cook time, tossing everything in together from the get to. This soup is naturally gluten free, dairy free and vegetarian. You can turn this into a creamy vegetable soup by adding in a can of evaporated milk or serving with a splash of heavy cream. You can bump up the protein by adding in some cooked chicken (maybe you have some of my Instant Pot Shredded Chicken left over in the fridge or freezer?? ), sausages or cooked ground beef. This Instant Pot Vegetable Soup is incredibly freezer friendly! Simply let cool to room temperature, pour into a freezer safe container or freezer bag, seal and freeze (be sure to lay flat if using a freezer bag for easy thawing). With soup, you need to make sure you leave room at the top if using a container of any kind as the soup will expand as it freezes. To heat, let thaw overnight in the refrigerator or in a sink of cold water. Then reheat in the microwave or on the stove top (or throw it back in the Instant Pot on saute!). *Note that not all dairy freezes well, so keep this in mind if adjusting the recipe. Heat oil in Instant Pot on saute mode. Add onion, cook and stir until softened. Turn the Instant Pot off and add the garlic, Italian seasoning, salt and pepper. Stir and cook for 1 minute on the residual heat. Add chicken broth to the still hot pan, and scrape the bottom with a spoon to remove any left behind bits. Add potatoes, carrots, celery, tomatoes and green beans and stir. Put the lid on, turn the valve to sealing, and select Manual or Pressure Cook for 2 minutes. It will take about 15 minutes to come to pressure and begin counting down. Once the cook time is over, let pressure release naturally for 8-10 minutes before opening the valve and removing the lid (this is to prevent the splatter that can come when pressure cooking soup). Stir in the spinach, adjust seasonings to taste and serve. *The recipe makes 4 litres of soup, or approximately 8 2-cup servings. Could i not sauté the veggies and just load everything into the Instant Pot and set the timer to Pressure Cook so it’s ready when I get home? You can definitely skip sauteeing the onion to save on time! I just made this in the instant pot, following the ingredients list exactly except I added some frozen corn. After sweating the veggies in the IP and then adding all ingredients, I cooked on high pressure for 2 minutes and let release naturally for 13 minutes, then did a quick release. For broth I used Better than Bullion veggie broth. So, so good. I’m so glad! Thanks Deborah! So easy and love that it’s packed with veggies! With all of the cold weather this week, I need to make this with some fresh bread on the side. Thanks for the recipe! I need a big bowl of this soup right now! Sounds perfect for a cold snowy day! Perfect for the winter! So easy and delicious. I love my Instant Pot and I can’t wait to make this! I eat soup all year long! So easy and perfect for this chilly day! Is this recipe based on a 6qt or an 8qt instant pot? I use a 6 quart Instant Pot but it will work perfectly in either!